Email the photo along with what size you’d like painted to art@robynmillar.com to receive a quote. To place an order, a non-refundable 50% deposit is given. I paint up a storm! Once the painting is ready, the remaining 50% deposit is given. A1: Yes – please feel free to email over multiple photos, and I’d be happy to help suggest which would translate best into a painting. TIP: please ensure photos are clear & crisp – the more detail in the photo the more detailed the painting can be! A2: Common sizes are 6″x6″, 8″x8″, 8″x10″, 10″x10″, 12″x12″, or larger, however alternate or custom sizes are also possible. Smallest available size is 5″x5″. All portraits are painted on 1.5″ deep gallery wrapped canvases. A3: To keep things flexible, there are a few different possibilities: Interac e-Transfer, certified cheque, cash, or PayPal (for Visa or MasterCard use). If you have questions about any of these methods, feel free to contact me and I’d be happy to help. A4: As order time fluctuates throughout the year, an eta will be provided at time of ordering. However, since there is an influx during the Christmas season, please budget for at least 8 weeks. If a rush is required (eg: birthday gift), it may be possible depending on my order schedule. Don’t worry though – order time can be confirmed prior to taking the initial deposit. The background will be removed and painted a solid colour. If you have a particular colour you would like please indicate at time of ordering. However if you have no preference, I’d be happy to select the most complimentary colour to your pet. If you would like the background of the painting left in (vs a solid colour), this is possible at an additional charge (quoted upon request). The edges of the canvas are painted black (unless otherwise specified), and all Pet Portraits are ready to hang frame free. Want a collar removed for the painting? No problem, this can be done at no additional charge. Gift Certificates are available if you would like to give a Pet Portrait painting as a gift but don’t have access to your friend or family member’s pet photos! Pet Portraits start at $140 CDN + 5% gst. If you live in Calgary Alberta Canada, we can coordinate a pick up or drop off situation to get your Pet Portrait to you. Not from Calgary? Not a problem! Pet Portraits can be shipped anywhere. But please note – shipping costs are not included in the price of the artwork (quoted upon request). Deposits are non-refundable & non-transferrable. By sending a photo to paint from, you ensure that either you took it yourself or have permission from the person who did take it. 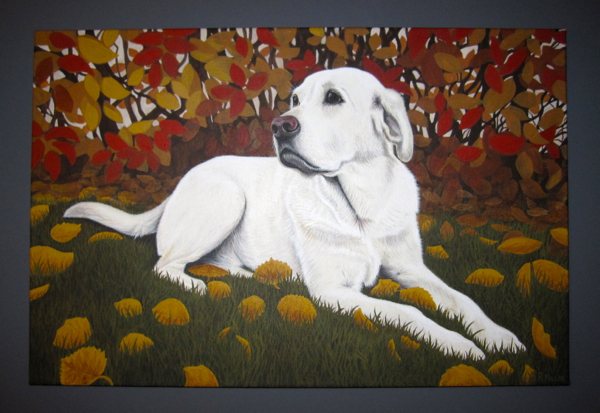 As Pet Portraits are custom painted based on your actual Pet, all art sales are final. A photo proof can be emailed prior to final deposit & pick up or shipping arrangements. Final payment ensures that the client is fully satisfied with the artwork and no adjustments to the painting will be made. Robyn Millar owns copyright to all her artwork. Artwork purchase does not transfer copyright. However if you would like to use images of your purchased works for personal use (not for profit! ), eg: as your profile picture, you may do so but please credit Robyn Millar and link back to her facebook page or website. If you have any questions at all, please feel free to contact me and I’d be happy to help!